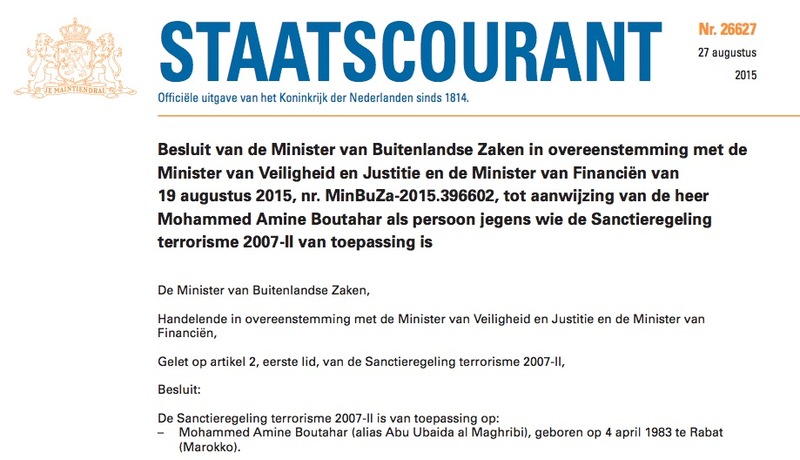 It went largely unnoticed when the Dutch Minister of Security and Justice designated Moroccan citizen Mohamed Amine Boutahar as an unwanted foreigner in July 2015. The official announcement did not mention a reason, but that reason became clear when Boutahar’s accounts were frozen the following month. Born in the Moroccan capital Rabat on the 4th of April 1983, Boutahar was added to the growing list of Dutch terror suspects, and local media quickly pointed out that his alias ‘Abu Ubaida al-Maghribi’ meant that Boutahar is the infamous heavyweight of the Islamic State serving as the head of security in Aleppo under whose command several Western hostages were imprisoned there. Even while he likely is identified now, nothing is known with certainty about Abu Ubaida/Boutahar’s past. But his death is fairly documented now. Two years ago already, there were rumours about him being executed by Islamic State. According to some sources he was beheaded, while others told that he was shot. But most accounts agreed about the reason, being the suspicion that he had passed secret information to a foreign intelligence service — possibly during negotiations about the fate of Western hostages he held. A recent German court document not only confirms that Abu Ubaida/Boutahar was executed by his own group, but also provides details. The information is contained in the judgment of a German foreign fighter named Nils Donath, who was sentenced to four years and six months in jail on 4 March 2016 in Düsseldorf. Donath served a while in one of the prisons that were led by Abu Ubaida/Boutahar while he was in Syria between October 2013 and November 2014. According to the judgment, Abu Ubaida/Boutahar was arrested mid-April 2014 on the orders of Abu Ayyub al-Ansari, who had succeeded Abu Athir al-Absi as Islamic State’s Aleppo governor shortly before. The reason for that arrest was a suicide attack ordered by Abu Ubaida/Boutahar in that same month, in which Jabhat an-Nusra commander Abu Muhammad al-Ansari was killed with his wife and his daughter in the Idlib governorate. The German defendant Nils Donath declared that in his opinion, that attack was wrongly aimed. The man who had to be killed, Donath told his interrogators, was Jabhat an-Nusra’s number one — the Syrian Ahmed Hussein al-Shar’a, better known as Abu Mohammad al-Julani. At the end of April 2014, Abu Ubaida/Boutahar was executed by gunshot in the presence of several members of Islamic State’s security department, after which his body was thrown in a well. The judgment doesn’t state explicitly whether Donath witnessed the execution himself. Still according to the German judgment — and thus the declarations of defendant Nils Donath — Abu Ubaida/Boutahar was succeeded as security chief in Aleppo by a man identified as ‘Abu Mohamed Franzi’. This Frenchman, Donath told, had served as bodyguard for Umar as-Shishani, the former leader of ‘Katibat al-Muhajireen’ who soon became the overall military commander of Islamic State in Syria. In his confessions, Donath spoke about a large gathering in March 2014 on a military airport near the city of al-Bab, where hundreds of fighters pledged their oath of allegiance to Islamic State leader Abu Bakr al-Baghdadi. They did so in the hands of a Saudi judge who had arrived there with as-Shishani, and for whom the Frenchman ‘Abu Mohamed Franzi’ seemed to serve as bodyguard too. It is very likely that this ‘Abu Mohamed Franzi’ was the very same person as the ‘Abu Mohamed al-Faransi’ mentioned above as the one-time prison chief in Sheikh Najjar. This French successor of Abu Ubaida/Boutahar must have been Salim Benghalem, one of the most notorious Frenchmen within Islamic State. He has a profile that matches the function and is known as ‘Abu Mohamed al-Faransi’. Together with Mehdi Nemmouche (the perpetrator of the terrorist attack against the Jewish Museum in Brussels on 24 May 2014), Benghalem served as a warder for the four French hostages (Didier François, Edouard Elias, Nicolas Hénin and Pierre Torres) in a prison in Aleppo between July and December 2013. He was described as “Nemmouche’s superior” and “a professional veteran of the Jihad who had patiently climbed the ladder of Islamic State”. According to a memo from the French internal security service DGSI, quoted by Le Monde, Benghalem has also belonged to the religious police and acted as an executioner at an Islamic court in al-Bara near Aleppo. When the United States Treasury Department added the above-mentioned Umar as-Shishani to its list of ‘Specially Designated Global Terrorists’ in September 2014, it did so simultaneously with Benghalem — Shishani’s one time bodyguard, if it’s him who has indeed replaced Abu Ubaida/Boutahar.